Moringa powder is created through a simple process of drying fresh leaves then crushing them into a powder. No additives - just pure, organic moringa. Organic Moringa capsules contain vitamins, minerals and nutrients, helping your body to build strong health, increase stamina and vital energy. Buying Moringa products by the Case is different from buying individual bottles and bags, in that instead of individually packaged bags or bottles, you can buy full bulk cases at wholesale prices. And you can buy just 1 case to qualify for wholesale pricing, and save more per container. Caution! 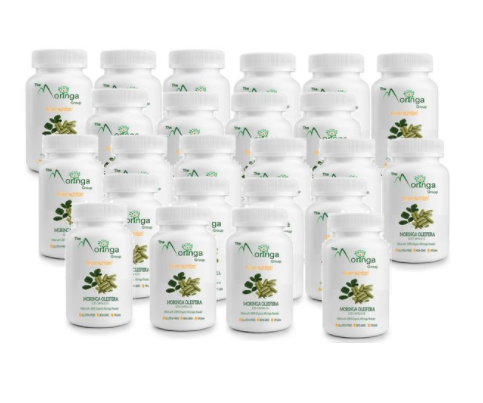 Not only will your customers, friends, and family continue to be enthusiastic with the same high quality premium organic Moringa Products we have available by the bag or bottle, but you will also be thrilled with our exceptional prices! Who orders by the case? We would love to answer any questions that you might have. Feel free to email us, day or night, at info@themoringagroup.com. Enjoy the amazing products at these amazing prices!